Go!Go!Go!…do not ever look back!……..i realize that it was not as easy as 123 to make a perfect gifts for all….Need a full strength, patience and also sacrifice; means…no routine job been done for the day……so….no special dish, no laundry, no this, no that…….anyone facing the same situation like me too???? hohoho…….Errk! I have to stop here…..Penalty for M’sia Vs Indon…..wait arrr……. 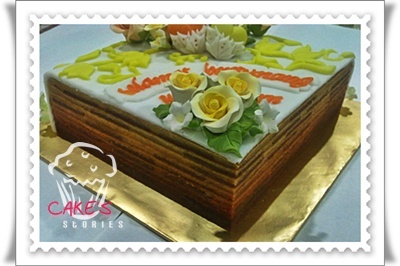 10q to Pn.Sabariah for the order…..requested a Sarawak layered cake in yellow for her cousin – Yaya n Zam. 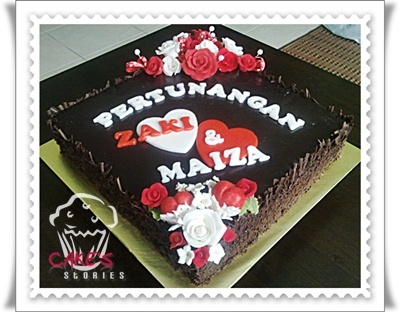 Wishing both of u with a happy marriage soon…..InsyaAllah. 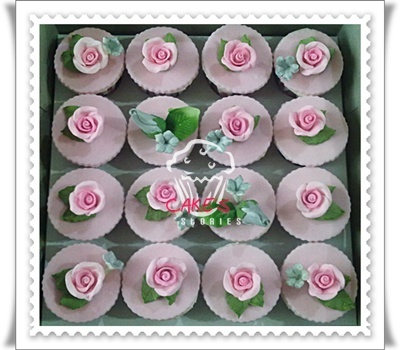 Almost a week I was up till 4a.m working out for these cakes decorations…..4 types of orders at the same time….huwaaaa!…No matter what happen, i have to face it! It’s a reality show ladies! 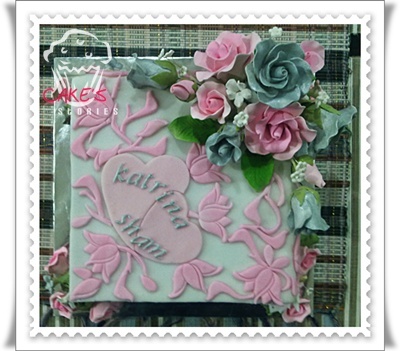 hahaha……Anyway, a very special thanks to Katrina for the orders and giving me the faith to fulfill your big day! TQ! TQ! 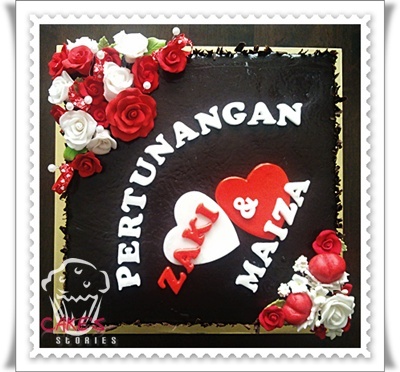 10Q to Mrs. Azleen for the order…12 inches cake for the 2nd time…..Chocolate moist with red & white roses….ain’t it look lovely and romantic huh??!! 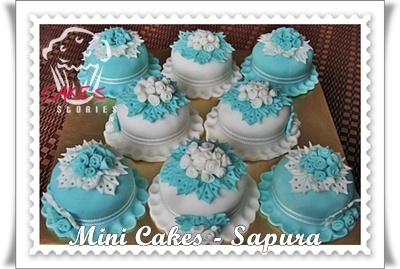 These mini cakes ordered from a bride to be at Ijok, Ms.Sapura….TQVM for the wedding invitation…So sorry we couldn’t attend it that day….May Allah bless ur wedding till end….Amiinnn. 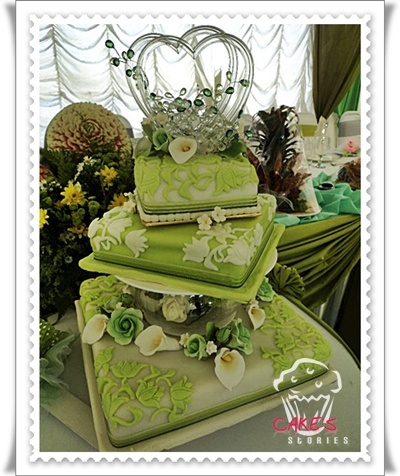 I really like the perfect colors of apple green on this cake! Actually I’ve posted this pic before my pc’s sent to ICU…hihihi…..but without any story behind the scene. ….Believe me! 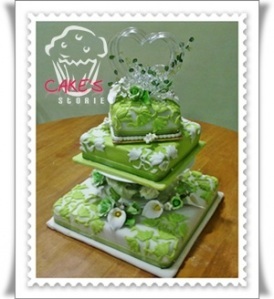 This is the first 3 tiers wedding cake i’ve made! Fuhhh….. Alhamdulillah, it really works! TQVM to my mom & dad for looking after the kids and cook for us on that day…….and of cz to my deary….i knew i shouldn’t do this during their vacation here…hehehe……lots of love to all of u, mmuuaaahhh…….TQVM to Mrs.Azleen, u really gives us ur warmest support! Continuously from previous posting, let’s take a moment to give thanks for everything and everyone we love. …..Thank you so much for stopping by here, either viewing, reading all the stories behind the scene or jotting any comments, without u…..what the hell is the fun in life, right? …….Yeah……move on baby!!! 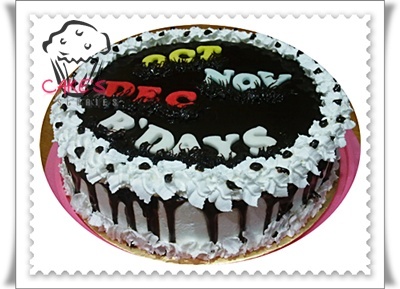 Oct 31st – Al Husni birthday celebration for Oct, Nov and Dec kids!! 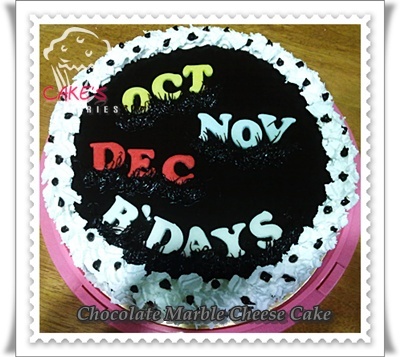 A chocolate marble cheese cake………yummy! 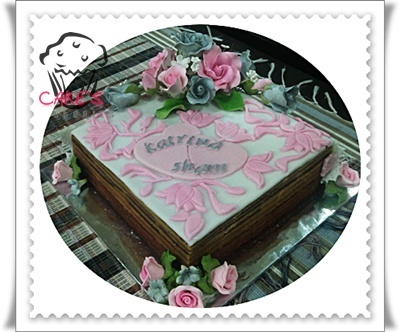 a very mouth watering cake of ever….lalala……. 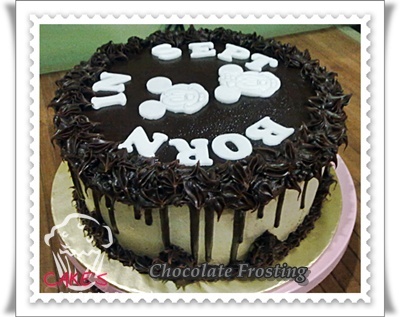 Sept 30th – A flowery chocolate frosting cake for Al-Husni kids birthday who really, really loves chocolate!!! 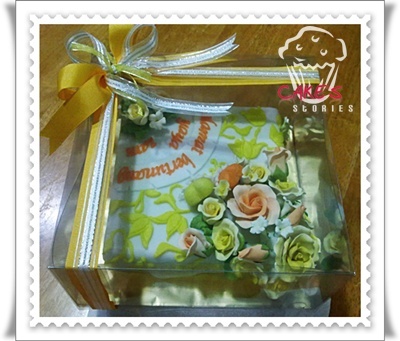 Aug 18th ~ 25th: No pic been taken for Hari Raya orders…….hehehe…..super duper bz beb! 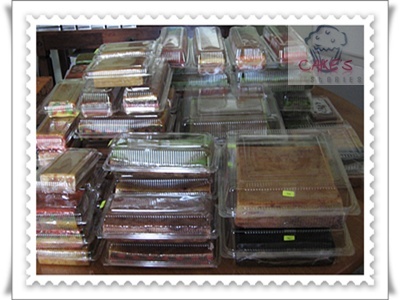 Just wanna thanks to all who ordered the Sarawak Layered cakes……A big hug from Cakestories! 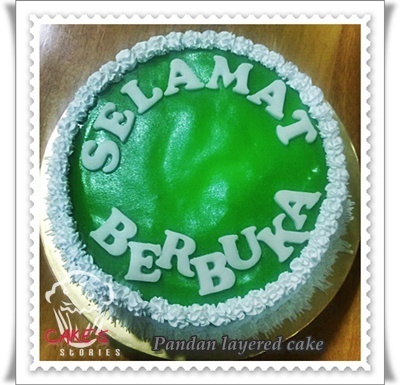 Aug 1st – Pandan layered cake for Berbuka puasa……this was the best idea from a mum, a teacher and a cook for her family, Pn. Sabariah…….it was really refreshing dessert and totally to see something different on the table this Ramadhan….TQVM k.Saba!! Salam and hi to all…..miss me??? It’s been quite a long silence huh! I really miss my blogging, my writing and sharing my stories…..I do have many2 things to share, many2 stories to tell but seriously…..my brain jammed!!! hahaha…..I’ve did it before and I don’t know where to start….and luckily I still remember the password! As always, my days full with the routine job and of course, the most important thing in my life is to make all ‘my housemates’ feel comfortable, good caring, good health and good food….! 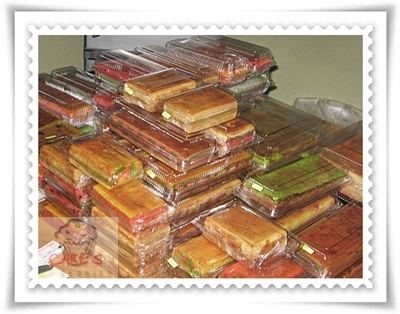 Numbers of posting are pending and alhamdulillah, today I’ll keep in touch with Hari Raya Aidilfitri memories last Sept….and TQVM to my aggressive agents for all the the good job and effort with LAYERED CAKES HOT SALES! Not for sale! 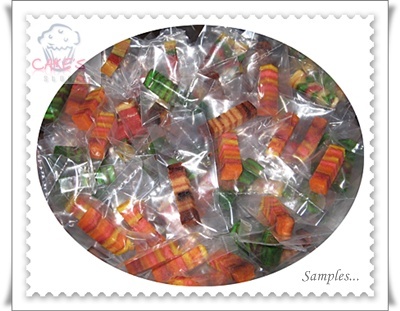 Samples for free….anyone? Really need full strength to do these! Packing & packing! 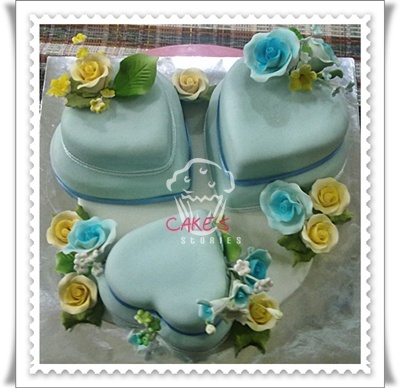 Upon successful delivery….My kids and i flown to Kch, leaving my other half lonely facing another few days fasting and counting the days to celebrate Hari Raya!! 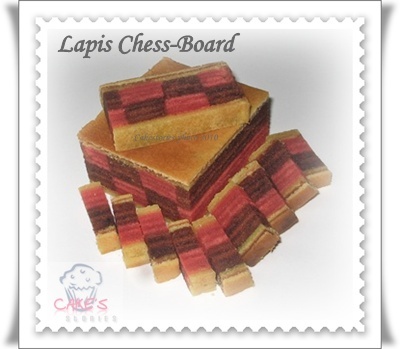 Yeaahh……..
Sarawak Layered Cakes or Kek Lapis is well-known as a cake which has its own specialty, unique and delightful colors, designs and also flavors. 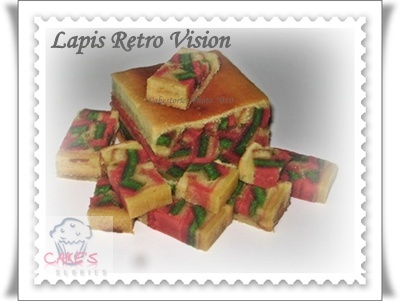 And for Sarawakians, it is a must for us to have at least 2 types of layered cakes in each house during Hari Raya. 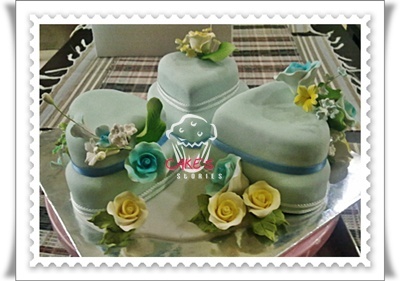 Back to Cakestories, I do bake new samples and orders last week (schedule is coming to be tight right now); even it really takes so much time and effort, patience to bake it, and yet is so quickly devoured. 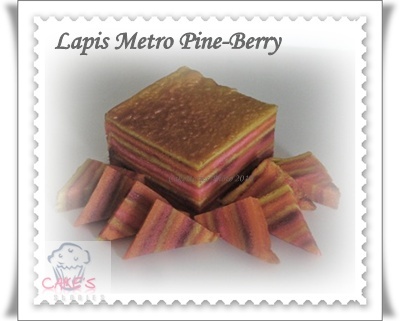 I do enjoy this home-biz and Alhamdulillah, Cakestories still commit with this Sarawak layer cakes for 3 years after declared……… Special thanks for my aggressive agents for the promotion! Well done guys!! 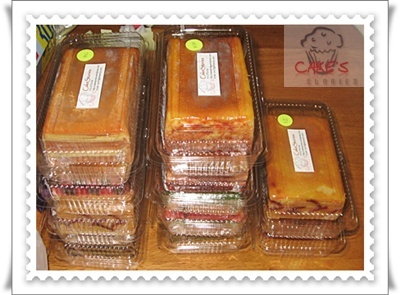 So make your choice and look out for the new layered cakes. 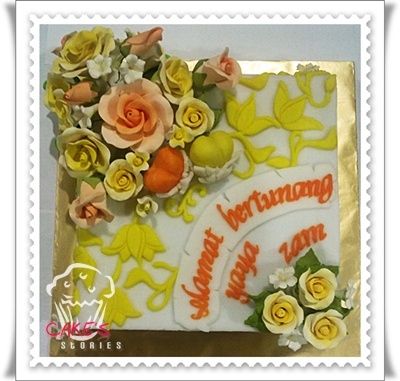 Now it’s the best time to select your centerpiece for this coming HARI RAYA and just pick your favors with special prices from us! 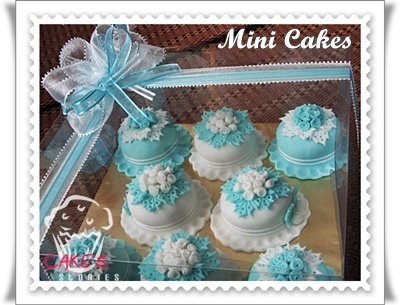 Dear Readers, booking is now open till August 27, 2010 (17th Ramadhan). Don’t miss it! Yeah!! I admit that I really need a pit-stop now…….. (I also need to pamper myself maaaa…). Enjoy the pics ……. 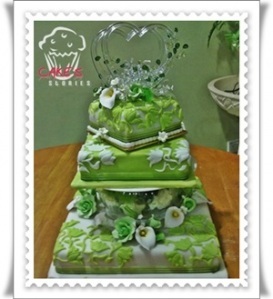 A Cake with 3 different flavors & colours (Pandan, Strawberry & Orange with green-red cherry tips! 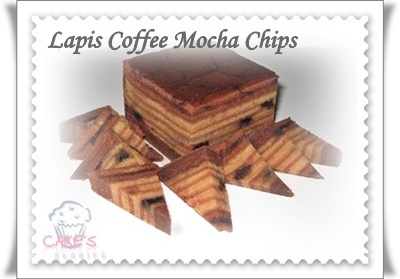 Layers with cappucino, coffee & mocha taste; scattered with chocolate chips! 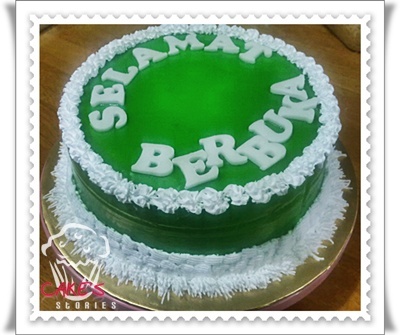 A green milky pandan flavored and sweet sour taste from decorative haw flakes……. 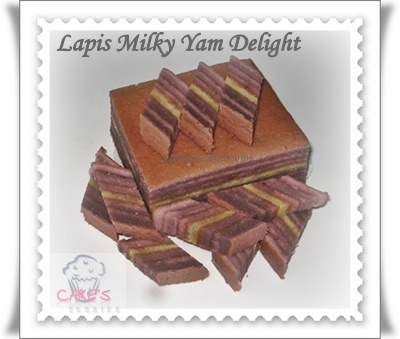 A real and rich milky yam taste in each layers for the yam lovers! 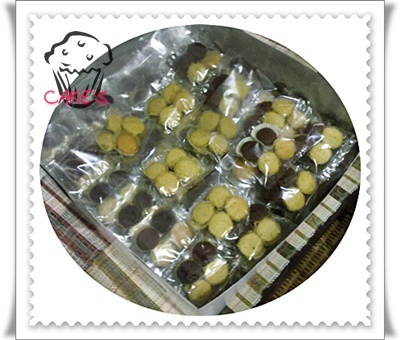 Ordinary buttervanilla flavor and spread peanuts. Want to play a game? Take this chess-board with tempting buttervanilla & mild chocolate taste…..
Ramadan is the ninth month of the Muslim calendar where all Muslims observe the Fast of Ramadan; fasting during daylight hours begin from dawn till sunset besides performing a special nightly prayers called, Tarawikh which held for the entire month……This is the best month ever in my life! We as Muslims are getting closer to Allah and whoever fasts or prays with faith and seeking rewards from Allah will have past sins forgiven. Besides, you will get in shape too for coming Hari Raya. Insya’allah….! Talking about getting in shape, Islamic fasting is different from such diet plans because in Ramadan fasting, there is no malnutrition or inadequate calorie intake, such as those which are protein only or fruit only. Everything that is permissible is taken in moderate quantities. But, Ramadhan also said as the food festival month! 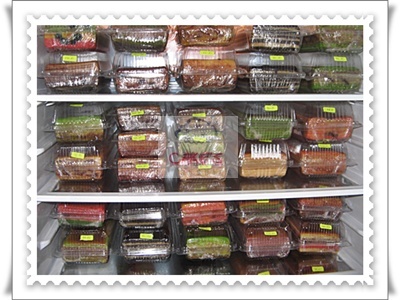 In Malaysia, many foods stalls rises-up and ‘Bazaar Ramadhan’ are everywhere selling variety foods and drinks with their own specialties; all will whet your appetite for sure and be careful in our spending, not to be wasteful in this holy month! I believed, all ladies, wives and moms start to scrutinizing magazines and recipes either to get ready for coming Aidil fitri or just giving a try to cook special cuisines and meals for “sahur” (pre-dawn meals) or “berbuka” (immediate meals taken for break fast)……. As for myself, I really having full-day commitment, less sleep, rest, double job or in other words – it’s the time to be an iron lady!